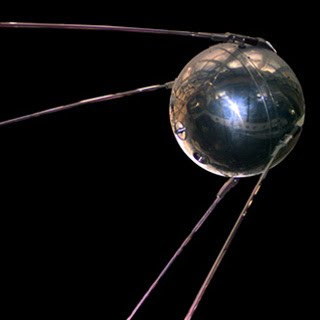 Sputnik 1 was launched on October 4, 1957, and marked the start of the U.S.-U.S.S.R Space Race. The satellite was 58.5 cm in diameter (just under 2 feet) and weighed 83.6 kg. It travelled at a speed of 29,000 kph, with an orbital period of about 96 minutes. After three months in orbit, Sputnik 1 fell from orbit and burned up after re-entering Earth's atmosphere. 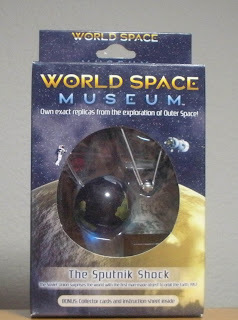 ArcLight's World Space Museum series includes the Sputnik (produced by Kaiyodo) as it's first model (WSM-10001). 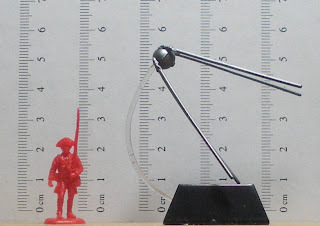 The set includes the satellite, a plastic stand with clear plastic support for the Sputnik, and a big glass marble with the Earth's landmasses printed on the surface. Also included in the box is a foldout information sheet describing the Sputnik, about a dozen trading cards, and another card that describes Tsiolkovsky rocket equation in Japanese. The satellite body scales out pretty much to 1/72, but the antennae are too thick. Also, unlike the pictures that you will usually find of Sputnik, the model does not have a shiny mirror-like finish. Overall, it is a simple representation of the Sputnik, though a tad pricey for what is essentially a ball with four sticks poking out of it.